If you change some attributes of web template in Web Application Designer for example no of row and columns displayed in report. You might worry why those settings are not applied by system if you run your query from portal environment. Then you will be running the same web template on portal and with your raw URL query links. 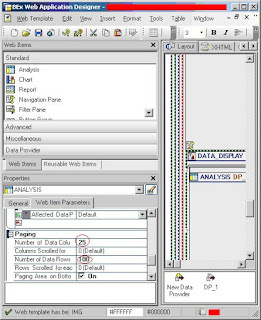 Here some abstract form SAP documentation about technical implementation of running BI object (report, query or web application) via the Java / EP runtime that I have found on service.sap.com. Technically a Launcher-iView (com.sap.ip.bi.bex) is being parameterized. For example if the object is a formatted report it is the parameter REPORT=xyz. That means technically a parameterized iView is executed (The portal navigation is per default not visible, only the iView directly in a browser window). You can save such an object directly in a portal role. Just create a BI iView, in our example the parameter REPORT=xyz has to be specified.The objects are also available via BI favorites or via the BI PFCG roles. Here the URL is being generated with placeholders similar to the ABAP runtime approach. Queries & Enterprise Reports are opened within a default template. The templates (for example the report default template 0REPORT_DEFAULT_TEMPLATE can be copied and modified according to your needs. What SP or SPS is? It is a collection of software corrections (SAP Notes) consisting of the best combination of aligned support packages and patches for a certain release published on quarterly basis. Just replace with the component that you need e.g. SAPKW70013.